The NorHaz removal process is designed to completely erase the high risk of asbestos exposure and ensuing health concerns. Kitchen tiles, attics, basements, house siding, paneling, roof shingles are just a few places asbestos can hide in the home. Insulation around water boilers, the inside of walls and ceiling paneling are just some of the spaces where contaminated vermiculite can be found in offices. 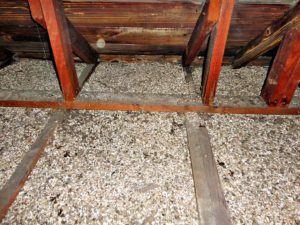 One of the most common and health-threatening locations you may find asbestos is in the vermiculite insulation in your attic. While not all vermiculite contains asbestos, most vermiculite sold and installed into homes prior to 1990 will likely contain asbestos. With over 100 years of combined experience, the NorHaz Team is qualified to handle contaminated vermiculite removal tasks. Our abatement procedures are safe and effective in removing harmful asbestos-based materials from commercial and residential properties. After completion, we leave the area completely hazard-free and dispose of the contaminated materials in a safe and effective manner. 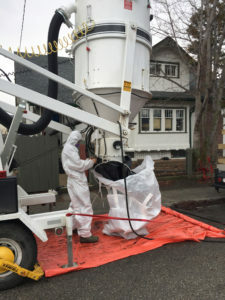 Relying on the Hurricane 500, a sophisticated vacuum machine, as well as our wealth of abatement expertise, we are able to removal all signs of asbestos in residential attics at the most competitive rates available on the market, while completing jobs quickly and with minimal interruption to our customer’s lives. If you suspect asbestos-containing vermiculite in your home or office, contact us today for a free quote.